The Industrial Technology Research Institute (ITRI), a Taiwan-based high-tech applied research institution, reported that it has received three 2018 R&D 100 Awards on November 16th in Florida, USA. One of the awarded innovation products was a portable UVC LED water sterilizer system. ITRI’s portable UVC LED water sterilizer system is the world’s first solar-powered flow-water sterilizer for emergency use. It efficiently produces clean water by killing water-borne bacteria with UVC LED technology. The device is designed for electricity lacking situations with its backup battery delivering 300 to 600 liters of sterilized water. Furthermore, the water sterilizer is easily distributed under extreme conditions to reduce the risks of water-borne diseases. 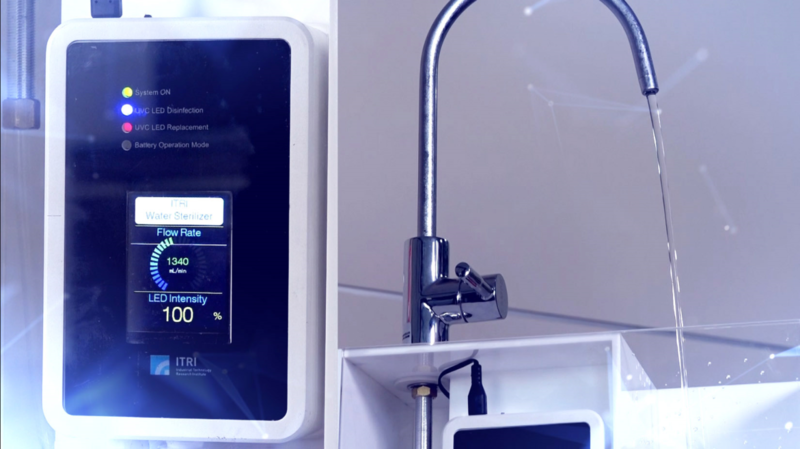 The Portable UVC LED Water Sterilizer System uses 60 milliwatts (mW) ultraviolet (UV) light power to sterilize contaminated water. It can kill up to 99.9 percent of bacteria at a flow rate of two liters per minute (LPM). The system can also connect with an Internet of Things (IoT) network for smart management and tracking. By adopting UVC LED and solar-power technology, the water sterilizer avoids problems such as overheating, short lifetime and high power consumption of the conventional mercury lamp-based flow-water purification systems. Moreover, it satisfies the Minamata Convention on Mercury, a global environmental protection initiative phasing out the production, import and export of products containing mercury by the year 2020. The water sterilizer, together with ITRI’s Automatic Police UAV Patrol System and Functional Dyeing Synchronized with CO2 Supercritical Technology were granted with 2018 R&D 100 Awards. “We are thrilled to win at R&D 100 Awards once again. I believe these winning technologies will provide a new force for the transformation of Taiwan’s industry,” said ITRI President Edwin Liu. “Through our efforts in promoting startups and upgrading industries, we hope these innovative R&D results can be successfully delivered from lab to market, contributing to economic growth,” he stressed.